This is Part three of AdventureYogi’s ultimate Vegan Christmas Dinner, click here, for part one: The Best Gravy You’ve Ever Had and part two:Mushroom and Chesnut Wellington ! Christmas dinner is the best time to get together with family and friends and share something delicious which is why these vegan recipes are sure to tickle anyones tastebuds, not just vegans! For desert? I’m afraid my household has never really been a fan of Christmas pudding so this is something different for all those non-fans out there. 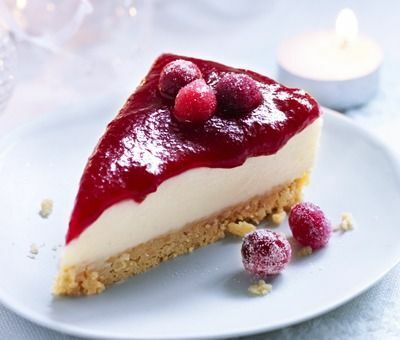 Mulled berry cheesecake is the highlight of my christmas and a lighter finish to a heavy meal. Preheat the oven to 350°F/180°C/Gas Mark 4. Grind the biscuits in a food processor or similar until there are no large lumps left. Melt the margarine or coconut oil and mix in the biscuit crumbs. Spread in a greased flat tin – about 18cm/7inches diameter if round – or a 20cm/8 inch square will do also. A loose-bottomed springform is the easiest to use! Bake the base in the oven for 5 minutes. Meanwhile, blend all the other ingredients thoroughly until smooth (except the fruit). Remove the crumb mixture from the oven and pour the filling over the base. Bake in the oven at the same temperature for 20-30minutes. To test, shake the tin and it shouldn’t wobble in the middle. Remove and leave to cool. Add your fruit to a saucepan and turn onto low heat. When the berries have started to reduce and resemble a sauce, add your mulled spices and arrowroot. Stir often and add more arrowroot if needed. Once desired consistency has been achieved, take off heat and add maple/agave syrup to taste. I like my fruit topping to be quite tart to contrast the cheesecake so add approx 2 tablespoons. Put fruit mix and cheesecake in the fridge until ready to serve. 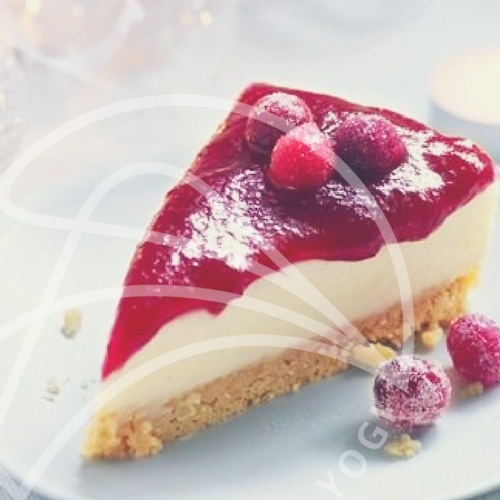 Slice the cheesecake then dribble the fruit mix all over it and enjoy!